This book provides an alternative method for measuring individual differences in psychological, educational, and other behavioral sciences studies. It is based on the assumptions of ordinal statistics as explained in Norman Cliff's 1996 Ordinal Methods for Behavioral Data Analysis. It provides the necessary background on ordinal measurement to permit its use to assess psychological and psychophysical tests and scales and interpret the data obtained. The authors believe that some of the behavioral measurement models used today do not fit the data or are inherently self-contradictory. Applications of these models can therefore lead to unwarranted inferences regarding the status of the derived variables. These methods can also be difficult to apply, particularly in small-sample contexts without making additional, unrealistic assumptions. Ordinal methods more closely reflect the original data, are simple to apply, and can be used in samples of any size. The book's approach is in essence a return to simple empiricism in psychological measurement. *ordinal test theory and the unfolding methods that are applicable to cross-cultural studies. Advanced students, researchers, and practitioners concerned with psychological measurement should find this book relevant. Measurement professionals will find it provides useful and simple methods that stimulate thought about measurement's real issues. Contents: Preface. The Purpose of Psychological Measurement. What Makes a Variable a Scale? Types of Assessment. Item Scores and Their Addition to Obtain Total Test Scores in the Case of Dichotomous Items. Item Scores and Their Addition to Obtain Total Test Scores in the Case of Polytomous Items. Dominance Analysis of Tests. Approaches to Ordering Things and Stimuli. Alternatives to Complete Paired Comparisons. The Unfolding Model. The Application of Ordinal Test Theory to Items in Tests Used in Cross-Cultural Comparisons. Appendices: Flow Chart for a Program to Carry Out a Complete Item Analysis of Items in a Test or Scale Using a Small Personal Computer. Statistical Tables. 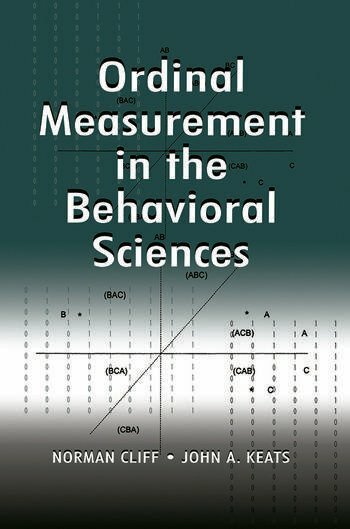 "This book....aims to step back from the model-driven perspective which underlies almost all of modern statistics, to adopt a more elementary empiricist perspective....a welcome addition to the literature on the foundations of measurement in psychology."